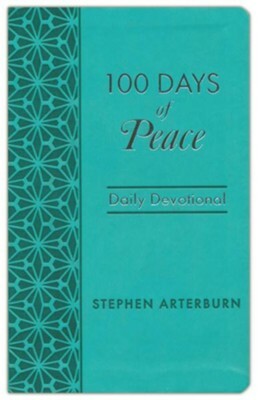 100 Days of Peace is a daily devotional by Stephen Arterburn. This book was published by Hendrickson Publishers/Rose Publishing. This devotional is set to release on March first, and will be available in paperback, leather-bound, and digital. Stephen Arterburn is the founder and chairman of New Life Ministries— a faith-based non-profit organization for counseling, support groups, etc— and is the author of over sixty books, some of which are: The Life Recover Bible (New Living Translation/NLT), Restoration Bible (Christian Standard Bible/CSB), The Every Man series, The Arterburn Wellness Series, 100 Days of Prayer, and 100 Days of Character. In 100 Days of Peace, each entry is two pages long, and begins with a Bible verse taken from the New International Version (NIV). After a short devotional/commentary, there are some Bible verses for further reflection, a few quotes from well-known Christian authors and theologians, and a prayer. Some of the daily themes are… God Offers Peace, Turbulent Times Build Character, God is Sufficient, Trust God’s Timing, Make Peace with the Past, and Guard Your Thoughts. Some of the entries were thought-provoking, some felt a little fluffy, and some didn’t really give me peace and comfort… I had a PDF to review, and if the physical book is exactly like the e-book, then the layout is visually appealing. I like the alternating page colors, too. The authors and theologians quoted are, how shall I put this… quite diverse. C.S. Lewis, Billy Graham, Oswald Chambers, Max Lucado, Corrie Ten Boom, Rick Warren, Beth Moore, D.L. Moody, Charles Spurgeon, Kay Arthur, Charles Stanley, A.W. Tozer, St. Augustine, Matthew Henry, Elisabeth Elliot, Joni Eareckson Tada, Joyce Meyer, Amy Carmichael, J.I. Packer, Lee Strobel, Lysa TerKeurst, Arthur W. Pink, Martin Luther, Warren Wiersbe, Eugene Peterson, Dietrich Bonhoeffer, John MacArthur, John Piper, and Tim Keller (there are a few names I missed). I personally have problems with some of the people who were quoted. Some of them don’t hold to orthodox views of the trinity and Jesus’ divinity. Some are women “preachers” and believe they’re sinless, or are involved in the prosperity gospel/Word of Faith (WOF). I think it’s dangerous putting them next to men like Spurgeon, Tozer, Matthew Henry, Piper, and MacArthur. Christians with little discernment may pick up their books or watch their videos after reading their quotes and get sucked into their heresy. A broken clock is right twice a day, but I would have preferred not having the quote section. Here’s an example of a daily entry. This is from day 4. As we have become accustomed to, and at times almost numbed by, a steady stream of unsettling news, we are reminded that our world is in a state of constant change. But God is not. So when the world seems to be trembling beneath our feet, we can be comforted in the knowledge that our heavenly Father is the Rock that cannot be shaken. Remember that God is far bigger than any problem you may face. Put your faith in the Father and his only begotten Son. After all, “Jesus Christ is the same yesterday and today and forever” (Hebrews 13:8). And it is precisely because your Savior does not change that you can face your challenges with courage for today and hope for tomorrow. Take your anxieties and troubles to God. Seek protection from the One who cannot be moved. Our heavenly Father stands ready to comfort you, to guide you, and—in time—to heal you. The same God who created the universe will protect you if you ask him . . . so ask him . . . and then serve him with willing hands and a trusting heart. Dear Lord, because of you, I can face the uncertainties of life with courage, with hope, with wisdom, and with faith. So today and every day, Father, I will study your Word; I will trust your promises; and I will follow your Son. Amen.